Seniors today have more Medicare options than ever before. Advantage plans to choose from. But which Medicare plan is right for you: Original Medicare vs Medicare Advantage? 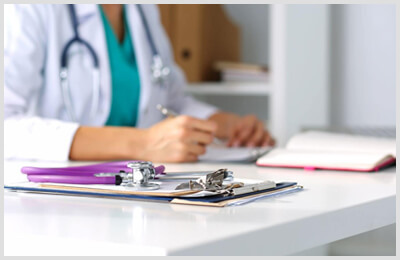 In this article, we will discuss the pros and cons of each program, so that you can decide which healthcare plan will be best of you. Let’s first understand what the Medicare program is and the basic differences between Original Medicare and Medicare Advantage. What do you need to consider while comparing each plan? When should you consider Original Medicare? When should you consider a Medicare Advantage plan? Who is good fit for Original Medicare? Who is good fit for Medicare Advantage? What are the pros and cons of Original Medicare? Traditionally, all of these groups would have a hard time finding adequate health insurance coverage at a reasonable price in the private insurance sector. Their age, their disabilities, or their illnesses, make them more difficult to insure. Original Medicare is the federal government’s traditional no-frills, fee-for-service plan. This health insurance is provided by the federal government and all of your premiums are paid to the government. It includes Part A (which covers hospital care) and Part B (which covers medical care, like doctor visits, lab tests and medical equipment). Everyone who is over 65 is eligible to receive Original Medicare and there is premium for Part B. Original Medicare covers 80% of your medical bills after you pay your deductible and does not include prescription drug coverage. Also known as Medicare Part C or MA plans, Medicare Advantage plans provide Medicare Part A and Part B — meaning inpatient hospital stays and outpatient doctor visits. Many Medicare Advantage plans also include a prescription drug coverage, known as Part D, as part of the plan. These plans are administered by private insurance companies who have contracted with the federal government to provide the insurance coverage. Premium is paid to an insurance company. Medicare Advantage Plans generally have less out of pocket costs than Original Medicare, and usually require you to pay a deductible and a copayment, but the rest of your medical bills are covered. To keep costs low, Medicare Advantage plans usually confine your medical services to a specific service area and you need to stay in your network to receive coverage. What do you need to consider when you compare each plan? You get your benefits directly from the federal government. It is made up of Part A and Part B, that provide your hospital coverage and outpatient medical insurance. If you have a qualifying work history, your Part A benefits are premium-free. Medicare Part B premiums are set each year by the federal government and most people pay the same standard rate. Some high earners (fewer than 5%) pay an income-related adjustment in addition to the standard Part B premium. There are no pre-existing condition limitations or waiting periods. Part A covers inpatient care when you are admitted to a hospital or skilled nursing home. It also covers hospice care and certain kinds of home health care. Part B pays for outpatient expenses like doctor visits, x-rays, and lab tests. It also covers durable medical equipment like wheelchairs and home oxygen supplies. Under Original Medicare, you can use any healthcare provider who accepts Medicare. This includes nearly 900,000 physicians nationwide. There are no networks. You pay the same amount for covered services from any of these providers, no matter which one you choose for your medical care. Medicare Advantage plans refile their benefits with Medicare each year. Many Medicare services require copayments or coinsurance, and plans might have deductibles and premiums. Premiums are set by the individual insurance company who runs your policy, and you have lots of options as to how coverage you want. Many Medicare Advantage plans have service area restrictions to limit coverage to a defined area. It covers all the same things as Original Medicare within a certain service area. Every Medicare Advantage plan has a maximum out-of-pocket amount; this amount is the most that you will spend on health costs each year. You are not responsible for 20% of all medical costs like you are with Original Medicare. For questions and claims, you deal with just one insurance company. You’ll want to find out if the medications you take are available on the plan formulary, and how much they cost. Most plans have dropped Medicare’s requirement of a 3-day hospital admission to receive skilled nursing facility coverage. Most people who choose Original Medicare plus a Medigap plan value freedom of access to Medicare’s entire network. Medicare’s network offers ultimate flexibility. Since there is no need to choose a primary care provider, you do not have to get a referral to see a specialist. This kind of flexibility is appealing to people who travel frequently or live a snowbird lifestyle because you can see doctors anywhere you go. Other people choose Original Medicare and Medigap because they want very predictable back-end costs. They want the peace of mind that comes from knowing exactly how much they will spend on a hospital stay or chronic illness. They buy for convenience and don’t mind spending a bit more to gain peace of mind. Enrolled in Original Medicare (Medicare Part A and Part B). Those who want a smaller premium and less out-of-pocket expenses. They want the peace of mind that comes from knowing that there is a limit to how much they will have to pay per year regardless of how much they use their insurance. One must live in the service area of a Medicare Advantage insurance provider that is accepting new users during your application period. You do not have End Stage Renal Disease (ESRD). Applicants with ESRD are usually barred from joining a Medicare Advantage plan, although those applicants may be able to get a Special Needs Plan. 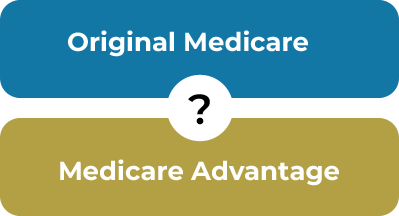 Which Is Better, Original Medicare or Medicare Advantage? At this point, you may be thinking, “One plan has got to be better!” The better option for you truly depends on your needs. Examining each plan with an unbiased approach helps reveal which plan is better for you. Comparing Original Medicare vs. Medicare Advantage is like comparing apples and oranges. Each plan has advantages and the hard part is figuring out which ones are most closely aligned with your needs. When you work with an independent agent, you will get the information you need to make an informed choice, and you can be sure that you’re going to get the best policy to suit your needs and lifestyle. How do you choose a Medicare Advantage plan? 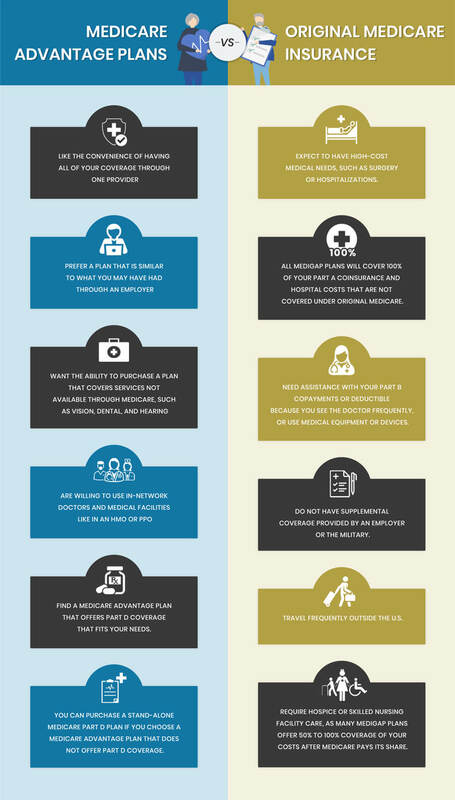 It’s up to you to determine which type of coverage is the right option. 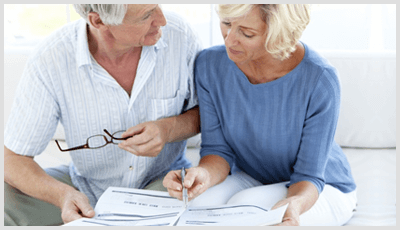 It’s important to read all of the details of each Medicare Advantage plan, including the fine print, and compare the different benefits, costs, and restrictions of each plan option available in your area. If you have a specific doctor or hospital that you want to use, be sure to check that they’re included in the network of the Medicare Advantage plan that you’re interested in. You may also want to think about any medications you take. While many Medicare Advantage plans include prescription drug coverage, some do not. 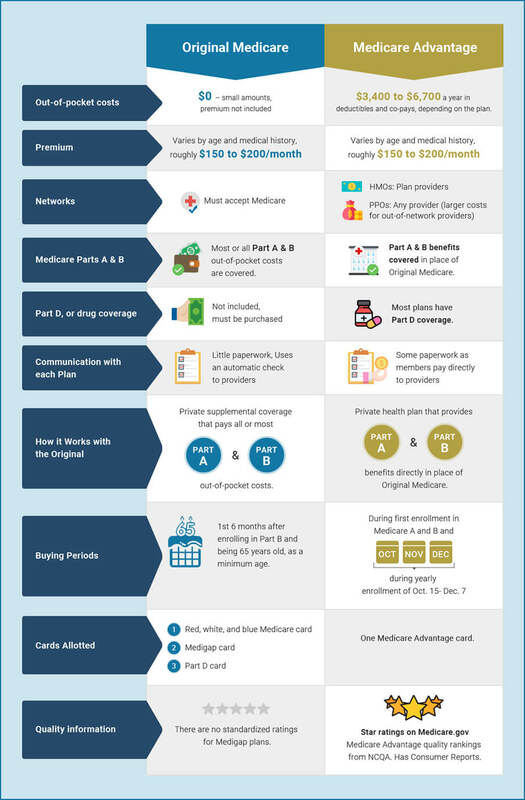 Whichever Medicare Advantage plan you choose, it’s important to check that it covers the prescriptions you need and compare the cost sharing because this may vary from plan to plan. Now, let’s look at Pros and Cons. Freedom to choose any doctor or hospital that accepts Medicare. There are no network constraints imposed by the provider (as is typical in an HMO) or by location. It may be complemented with a separate Medicare Part D plan with a separate premium. 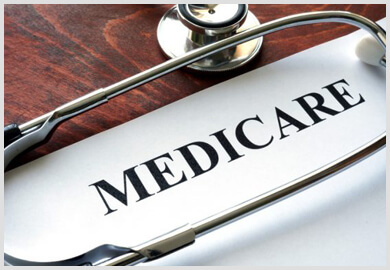 It may be complemented with a Medicare Supplement Plan (Medigap Plan) to protect against catastrophic out-of-pocket expenses incurred while on Part A and Part B of Original Medicare. Buying a Medigap policy limits your out-of-pocket costs, but requires an additional premium. Medicare Advantage premium is typically lower in comparison with total premiums spent on Medicare Supplement and Prescription Drug plans. The $0 premium plans are often available. There are limits on how much you will pay every year for medical costs. A Medigap policy charges an additional monthly premium. The Medigap policy may also be difficult to purchase or quite costly if done outside the Medicare Supplement Open Enrollment Period or the Guaranteed Issue Rights Period. You are always responsible for copayments and coinsurances, and sometimes even for deductibles. Your choice of doctors/hospitals is limited by the provider network within a specific geographic area. Members are required to pay an increased cost, sometimes up to the full price, for services outside the provider network. Medicare providers may not always accept Medicare Advantage plans so your choices may be limited. Some doctors and hospitals do not participate in any Medicare Advantage plans and others only in a selected few. Medicare Advantage plans may change every year. Such changes may affect your premium, deductibles, copayments/coinsurances, and the scope of extra services. Most plans require prior authorization for services. You will need a referral to see specialists. It may feel overwhelming to figure out which plan is right for you. Contact the Medicare specialists at Insurance Professionals of Arizona and we can walk you through all your options and answer any questions you may have. Depending on your personal situation, we can help you find the right Medicare insurance plan – one that fits your lifestyle, budget, and healthcare needs.